As every other geek-leaning blog in the universe has mentioned, Dungeons & Dragons co-creator Gary Gygax passed away the other day. I was never a huge gamer, but the man's creation was the source of a number of fun Sunday afternoons back in middle and high school (as well as a lot of funny questions from my dad about why people would want to play a game where you can't technically "win"). 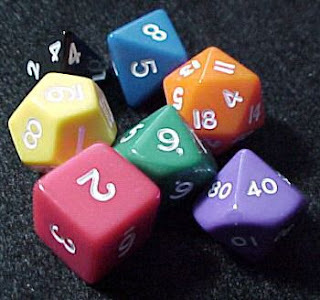 And if I were to look, I'm sure I could still find a d20 kicking around my house somewhere (and there are certainly some to be found in my parents' attic, I'm sure, along with a pile of GURPS and DC Heroes books that were fun to look at, even if they were never really used for actual gaming). So even though I might not talk, or even think, about it all that much anymore, Gary did impact my life in a positive way, and for that I'm thankful. Rest in peace, sir.